Another weekend almost gone. Going to do a quick report. I started with the corridor outside the two waiting rooms. This is a nice shapshot. 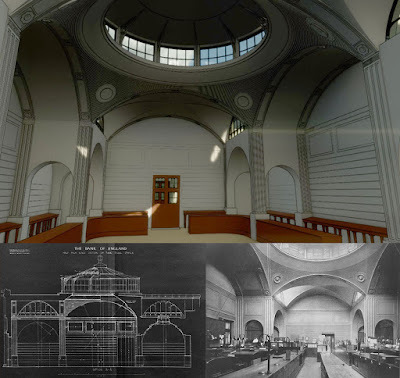 It shows kind of a before and after (left and right) as I started to refine the section based on Troup's survey drawings from just before the Bank was demolished in the 1920s. Also on show the windows to the waiting rooms, worked up by my Canadian collaborator, and just a hint of the two skylights courtesy of Matt in the UK. Zooming in you can see that I've started to add ceilings and an embryonic slit window family to be fitted out in Canada. You can also make out the roof slopes and the gutter which I guess leads to a downpipe embedded in the wall and down to the cellars where I guess it will eventually join the Walbrook, an ancient stream that was culverted and still flows under the Bank, to this day. Note how the slit window is sneaked in at high level, bouncing light down into the corridor indirectly. The side walls of the corridor were plastered to look like coursed stone. I have created Generic Model families for this which show up as solid grey. Looking for volunteers to create the pattern of joints. Also need someone to make a family for the ceiling coffer, with a plaster rosette in the middle. 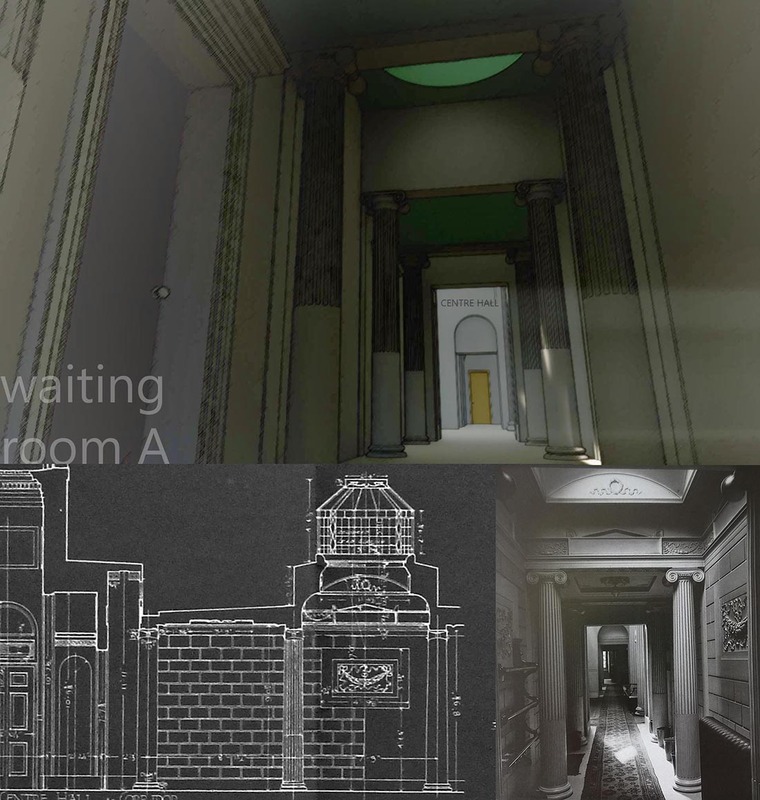 For such a small narrow space, Soane has gone to extraordinary trouble to articulate it volumetrically and to introduce dramatic lighting. Here you can see the plaster lining below the landing which is especially elaborate. I decided to take this challenge on myself. It uses a generous coved cornice to support a typical Soane shallow canopy dome. There's quite a bit of detail to add yet, I just made a start with the cartouche in the segmental arches below the dome. 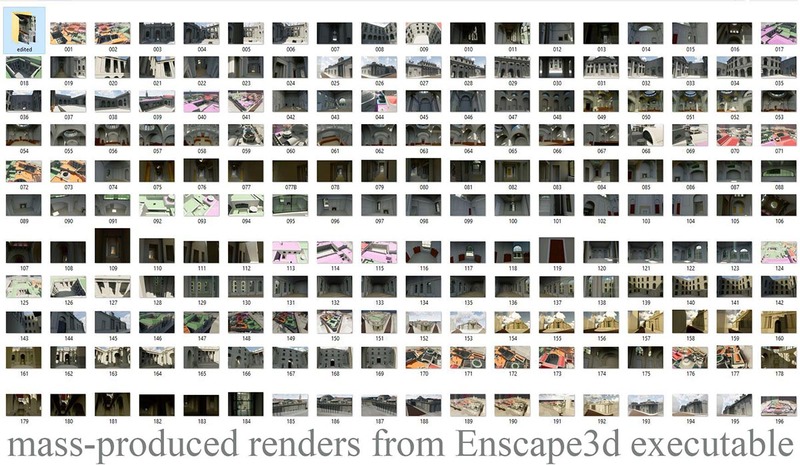 Let's see what Enscape3d makes of this space. The model is getting quite big and was starting to respond sluggishly, so I decided it was high time to implement worksets. Should have done that long ago to be honest. Also made a workset for the four transfer halls and the Rotunda, all of which I had modelled as rather large, elaborate families. I have to confess that I haven't yet got around to linking in Alberto's excellent model of the Bank Stock Office. Must do that now I have a workset system in place. Finally I decided to create a workset for the cellars that act as a brick-vaulted undercroft to the superstructure. Isolating walls quickly showed that some of them extended upwards and needed to be split. I decided it would also be sensible to put the topography and pads in their own workset. Yellow is basically interior flooring, and grey exterior courtyards. 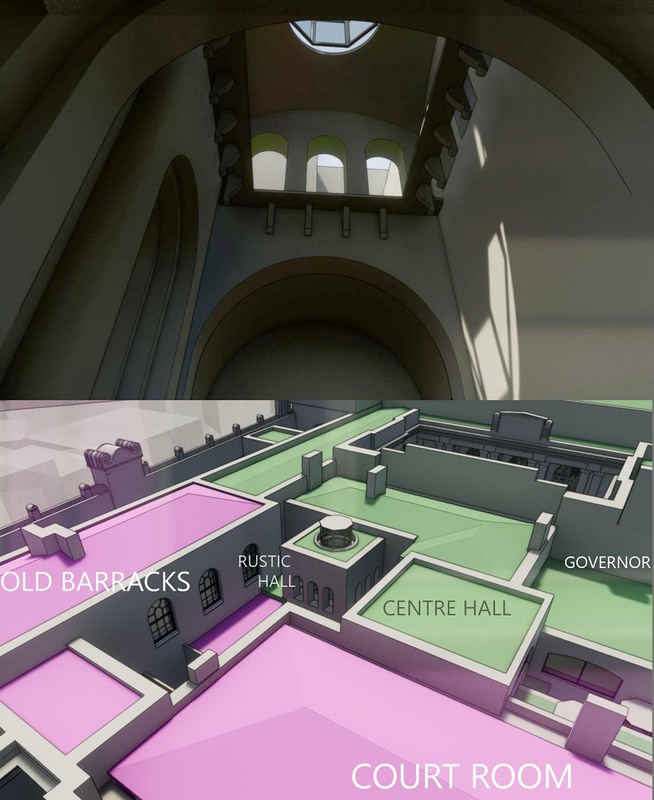 Having isolated the cellars in their own workset (transparent pink objects are families that represent brick groin vaults) I spent a bit of time improving this area of the model: extending walls, adding archways from space to space, placing more vaults. There's quite a good drawing to guide this walk in the online archive, but being hand-drawn it doesn't quite map perfectly to the model. I've used a bit of poetic license here and there to reconcile the two. So back to the Centre Hall, (and the model is much more responsive now, with most of the worksets closed) I like this cutaway axo which shows the Waiting Rooms and the Corridor leading up into the grandeur of the Centre Hall. I'm waiting on my collaborators to upgrade the impressive lunette windows and the fireplace. Also there are coffers missing from the side arches but still, it's shaping up quite nicely when viewed with Enscape3d. I am packaging up tasks into manageable, short, Family Editor exercises. You get a starter file and a set of reference images. The task involves increasing the Level of Detail. 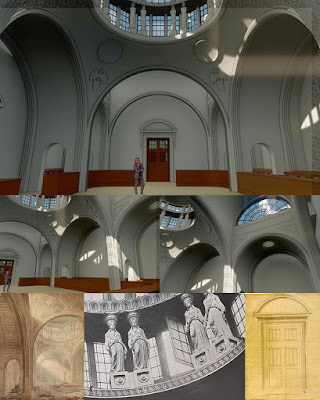 There is a super-family in there that includes the vaults of the "starfish ceiling", the fireplace, skirting (base) board and a very simple family to represent the decorative arch that frames the barrel vaults at either side of the main space. The fireplace needs quite a lot of work, and there's a chair rail to be added too. I have taken ownership of all the door families for the moment because they follow quite a complex nested system of my own devising. I spent some time enlarging and refining this door based on the reference material. Needs some mouldings around the panels, but otherwise it's pretty much there. The window family needs to be fleshed out with mullions and glazing bars. Fairly good reference images for that. The lantern at the centre, atop the vaults also needs an update and there's a survey drawing that provides a good reference for that. The photos also show furniture and paintings which it would be nice to add. So this is going to be an interesting experiment. Two keen volunteers at present, so if you want to contribute you'd better jump in fast. Meanwhile I will be working hard to extend this kind of exercise to adjacent spaces. So lots of scope for more people to join in the fun. Essentially, the aim is to bring more parts of the model up to the kind of detail level that Russell and Alberto achieved in the original modelling competition. 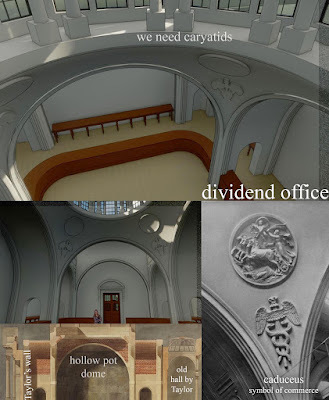 While I was putting my energies into understanding the way that the whole composition of the bank had developed over time they focused on the two major banking hall spaces that were part of that exercise. I did also model the exterior screen wall up to quite a good level of detail, but most of my work is still quite roughly massed out. With that in mind I decided to revisit the Consols Transfer Office model. Actually I wanted to plunder Russell's work for some specific details that have parallels the Waiting Rooms: coffers on a curved surface, and rows of spherical beads. So I extracted these families and put them into our reference database. It turns out that his meshes are too complex to allow for the DXF export that this technique uses, so I hunted around for a way of reducing the polygon count. This led my to install MeshLab, which is open-source software that I have never used before, but well enough documented for me to stumble through a successful simplification process. 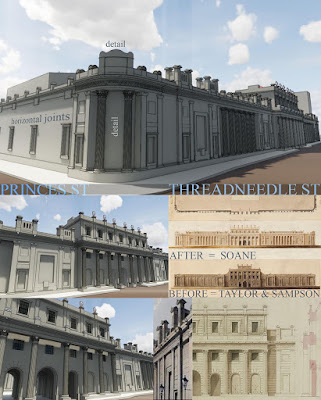 I'm not so worried about the detail because in any case these models differ from Soane's designs in a number of ways. In other words they are placeholders that convey the design intent, which is what BIM is for the most part anyway. Keep it Simple Sunshine, Less is More. I really have no idea what Clustering Decimation is, or whether it's the best technique to use. I just read a few sentences in the help, scrolled down a long list until I saw something that looked promising and decided the result was good enough. There's something fascinating about the way that software and the human brain interact. On one level it's very mechanical, but on another level the intuitive leaps of faith are also really vital. I do wish the lion's eyes were a little more sharply defined. Actually I've seen some better heads on the web, but haven't figured out how to download them yet. 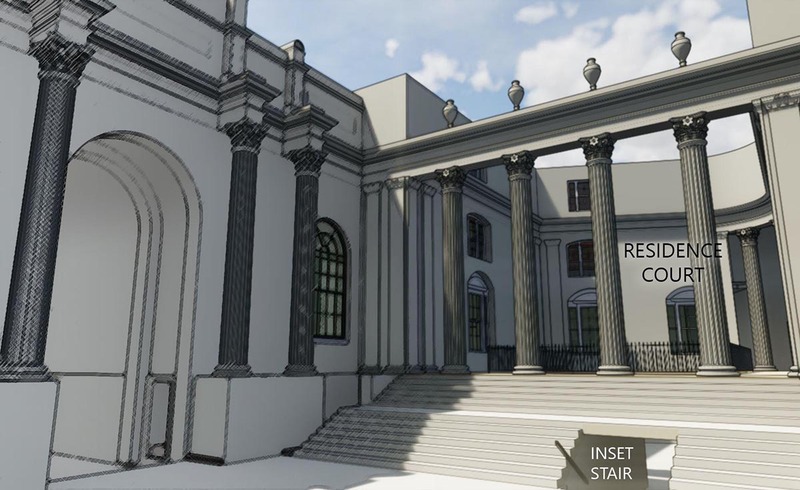 I cheated in front elevation by adding some symbolic lines, and the shadows help in 3d views, but you have to agree that the stone-carver's version is far more artistically satisfying than the digital modeller's. Russell had disguised the mesh edges by setting the subcategory to a very pale grey, which also means that the outer contour loses definition. So all round I'm quite proud of my new lightweight versions. It would be great to find mesh sources for some of the other sculptural elements that we need. Or maybe someone with mesh editing skills wants to have a go. While thinking up a title for this post I discovered that my first two choices had already been used up. These two posts from April and November 2016 reminded how far the model has come, working in bursts of enthusiasm punctuated by quieter periods. 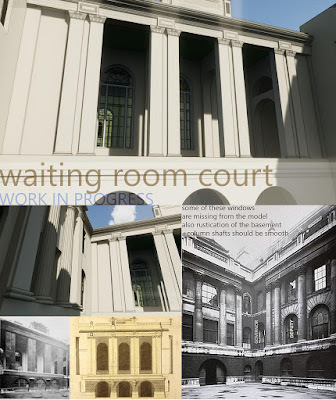 is the first post, but in fact it's mostly about the Waiting Room Court. The Director's Parlours, where these two small waiting rooms are situated was just an amorphous flat-roofed space at that stage. I hadn't yet acquired the survey drawings that helped me to understand the complexity of the roofscape with its multiple lanterns. records that process of discovery. When I first built the super-family with the starfish ceiling (although I wasn't yet using that terminology) This post reminds me that although it all seems so simple and obvious now, I really was stumbling about in the dark for the longest time. Come stumble with me. . Heading East down Threadneedle Street we arrive at the Entrance Building with its three round arches. 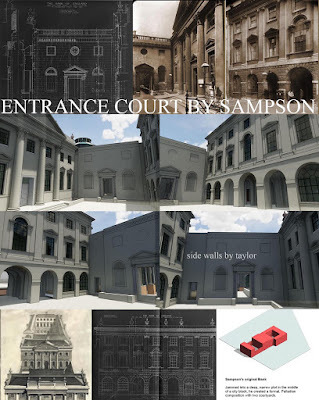 This is the front portion of Sampson's original double-courtyard block from 1734, but the external street frontage was completely remodelled by Soane as one of the last significant contributions he made to the design of the Bank: the final unifying gesture, stamping his identity on a rambling complex that had evolved over almost a century under the direction of three different architects. 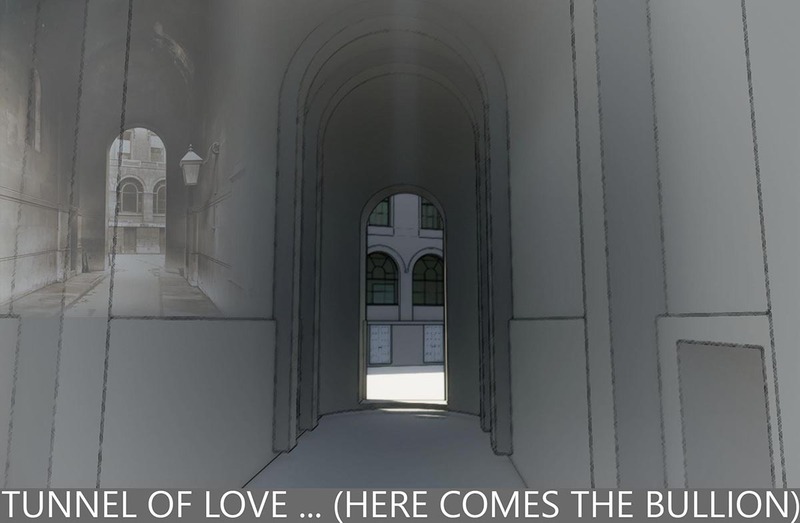 Proceeding through the central arch we see the Pay Hall in front of us across the courtyard. You can imagine coaches and horses turning around in this space after dropping stockholders off to collect their dividend. 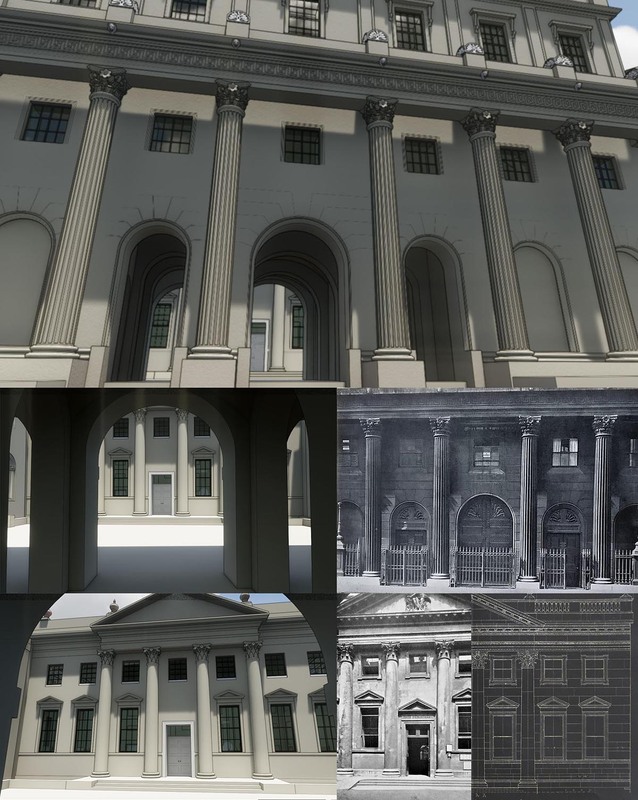 This facade is still basically Sampson's design. 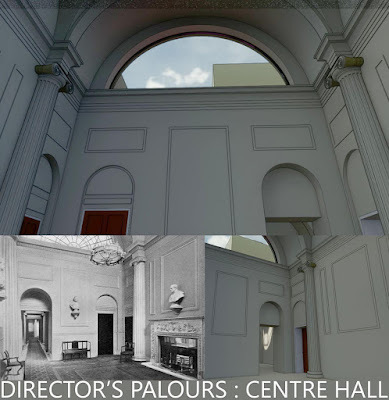 If you compare the photographs and survey drawings to the model you can see that the basic composition is there, all ready to welcome some lucky volunteer who wants to fill in the missing details: pediment over the door, mouldings around the first floor windows, the rhythm of modillions running along to offer support to the overhanging cornice. 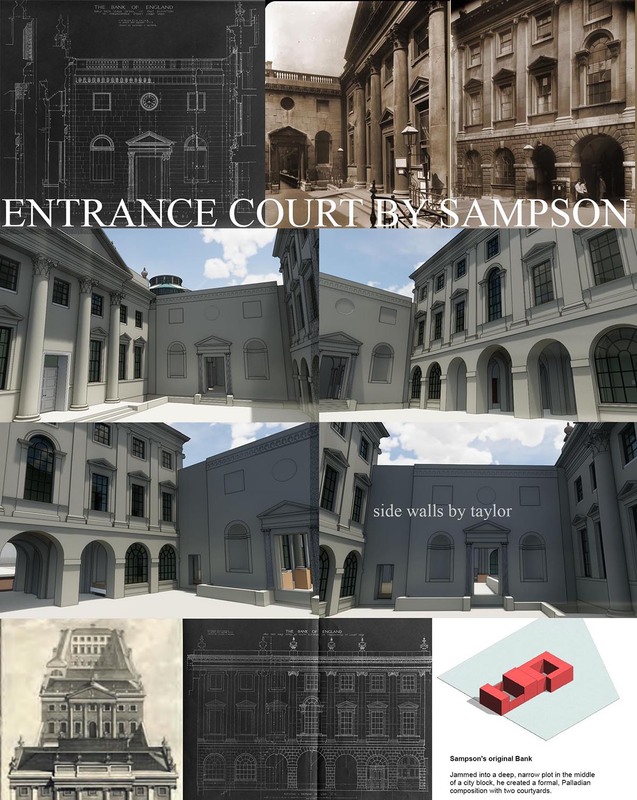 Inside the courtyard we see two main facades by Sampson facing each other, and shorter side walls closing off the two sides by Taylor. In fact this is one of the few areas where Soane's influence can barely by detected. The rustication to the base of the Entrance Block is an interesting modelling challenge if someone wants to take it up. And there are balustrades to be added to Taylor's side walls. 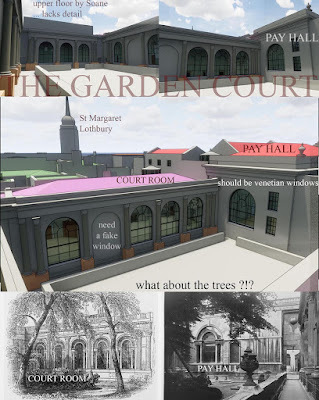 Turning left we can progress into the Garden Court, the second of Taylor's two major extensions. Quite a lot more work to be done here. Sampson's block was built next to a church, and this was the graveyard, which is one reason why it wasn't built over. The directors decided that this leafy open space would provide a good view for the Court Room which was moved from it's original location behind the Pay Hall. We need to recreate this churchyard atmosphere: add some trees, model the intriguing Venetian windows (probably not parametric, given the complexity, and I think we only need one size), what else. 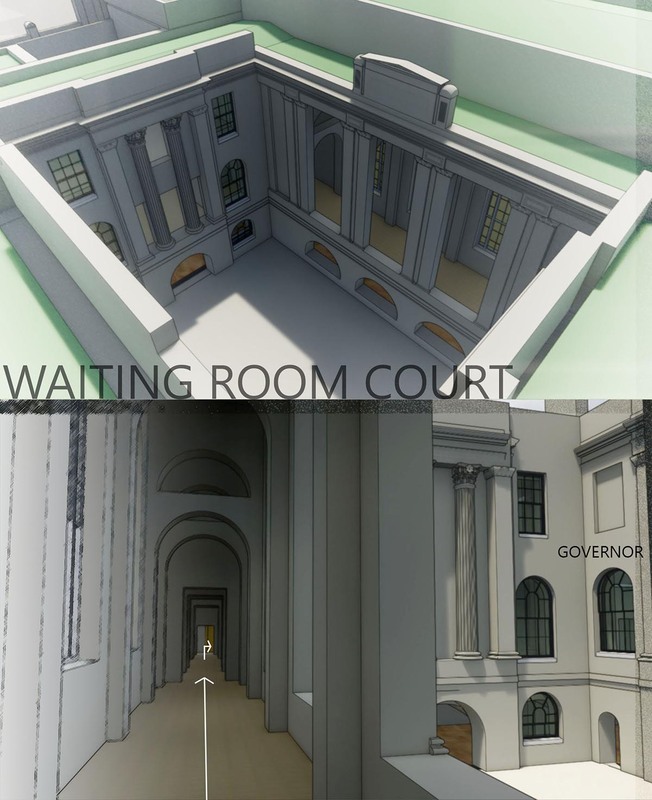 There are more balustrades and rustication; one of the windows needs to be "blind" because the wall dividing the Court Room from the smaller, octagonal Committee Room hits it right in the middle. Let's go flying again, floating upwards and backwards, until we can look back over the whole complex. The upper storey on the Princes Street side of the Garden Court is by Soane and we have some very interesting drawings. He had his pupils sketch the work in progress, so we get some real insight into the technology and processes involved. This is little more than a box of four walls and a roof at present, so once again an interesting project for someone to take on. There's a structural puzzle here that I haven't fully solved yet. The walls are set back from the lower storey, so how are they supported? No reinforced concrete cantilevers in Soane's day. Why don't we swoop forwards and down, fly through one of those fancy windows, (the one in the end wall of the Pay Hall) so we can take a look at the interior. It's the usual story: the basic elements are all there, but crudely modelled, basically Sampson but with some modifications by Soane. It's not clear to me which of the drawings in the archive were actually implemented. I think we will just have to make a judgement call, try to catch something of the spirit of the engravings. Carry on to the far end of the Pay Hall, rise up through the ceiling and once outside, wheel around to look back at the roof of the space between the Pay Hall and the Rotunda. This is an interesting space. Taylor designed it as a lobby, part of a dog-leg passage connecting the Rotunda to the Entrance Court. Soane modified it twice. Early on he made the lobby narrower, to squeeze in some extra office space. That must be when he inserted four Ionic Columns carrying arches that support a dome with a central lantern. This a motif he was to repeat many times in different ways. More than twenty years later he created a shortcut route, by punching a hole in one corner of the Rotunda. 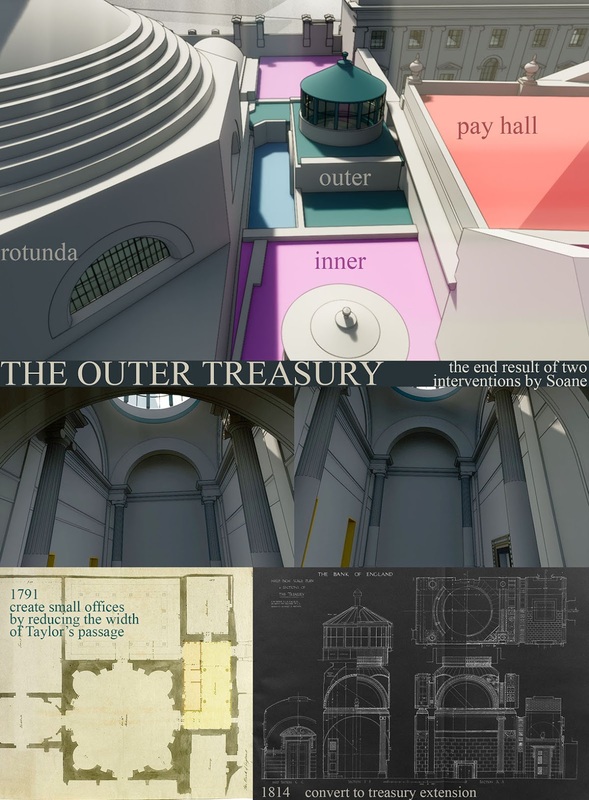 The lobby could then be walled off and converted into an extension of the Treasury. Now let's slide sideways into the Rotunda itself. Soane completely remodelled this space, constructing a new inner lining, supporting a masonry dome to replace Taylor's timber version. The basic massing is there in the model, but we need to tackle the decoration which is quite an original take on predominantly Greek motifs. I really like the undulating lines that snake around the arches of the high level lunette windows. 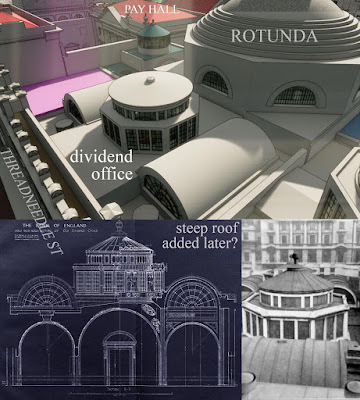 The rotunda is one of three spaces that Soane remodelled during his first major building campaign at the Bank. He had done quite a lot in the previous three or four years since his appointment, but mostly smaller interventions around the back of the Bank. Finally he had the opportunity to design a suite of three public spaces, proving himself to the directors and the world at large. The second of these spaces (a transfer hall for Bank Stock) is arguably the best known, and the only interior space that has been reinstated in its original form. It now houses part of the Bank Museum. I've visited it several times over the past ten years. What I'm showing here is my version of this space, but there is a more detailed model by Alberto Vilas Blanco who was one of the winners in the first stage of the competition. 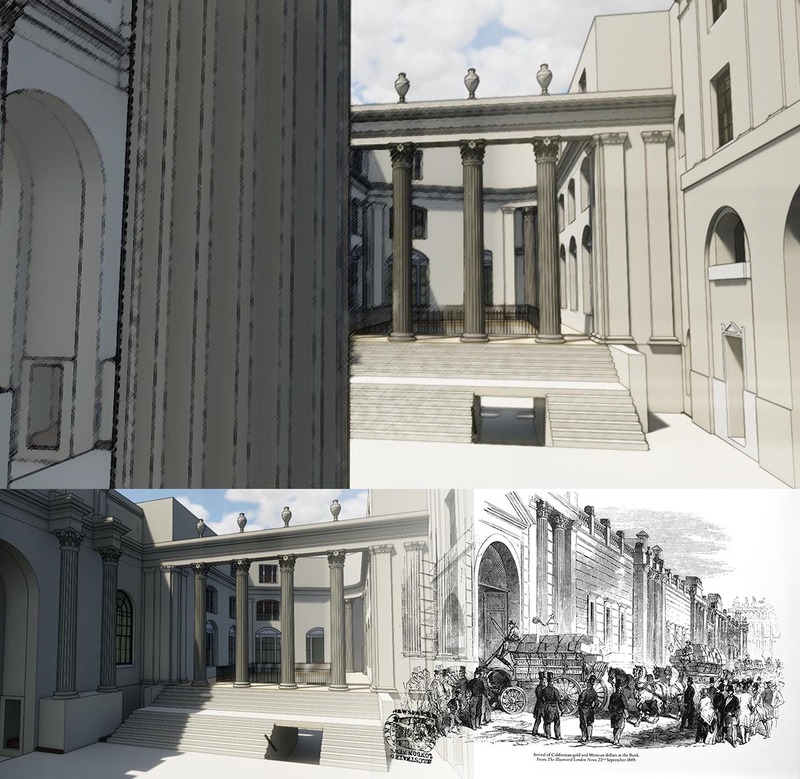 At some stage we need to carry out a careful review of his work and mine, compare this to the photos, survey drawings and Soane's own design sketches. 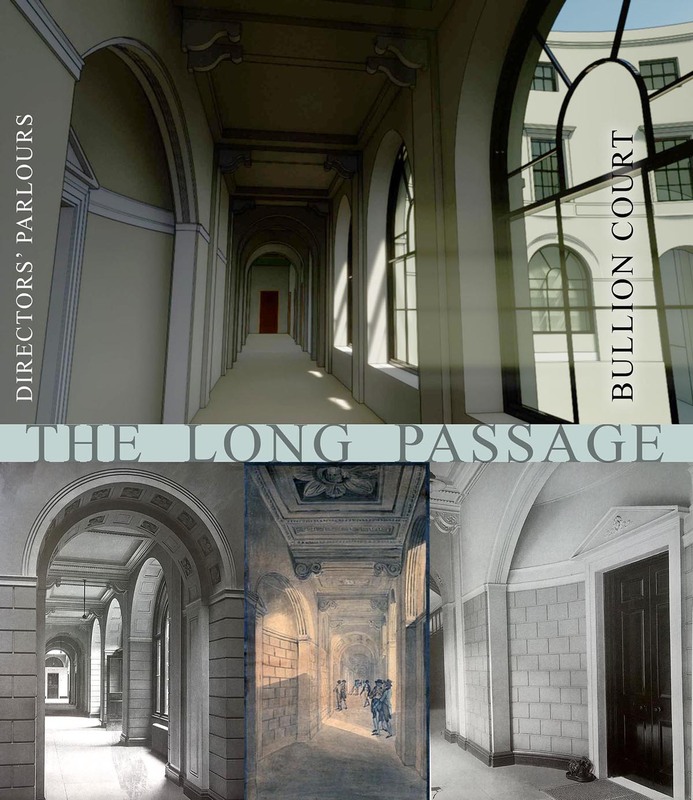 The photos are of two kinds: some from the early twentieth century which include minor modifications done after Soane's death, and a much larger number of the reconstructed space as it is today. What impresses most contemporary architects is the level of abstraction in this space. He has simplifed the classical orders down into bold geometries with a strong emphasis on parallel incised grooves. 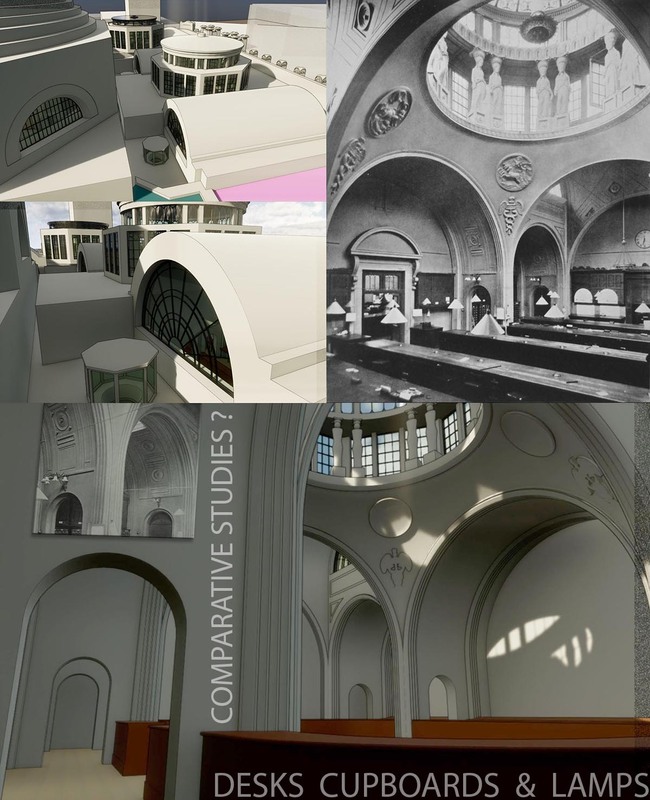 The shallow segmental arches and dome are also seen as typical of the "Soane Style" which was very controversial in his day but highly respected today. But the fact is that he didn't always work in this stripped down, idiosyncratic idiom. Taylor built four transfer halls around the Rotunda. They all had complex timber roofs with skylights that seem designed to leak. That's why Soane got the go ahead to replace them one by one. He stripped each one back to a brick box and designed new masonry structures to replace Taylor's flimsy timber versions. He was aiming for security, fire-proofing, durability. Having completed the first two of these transfer halls, his attention was diverted elsewhere for 25 years before he got the chance to rebuild the remaining pair. These use essentially the same planning concept but with several differences. Let's start with the Colonial office which is due south of the Stock Office. In place of the shallow arches, we now have soaring semi-circles which seem to spring out of the ground and sweep across in continuous curves. 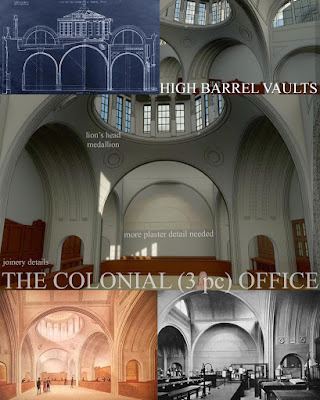 So we have a loftier sense of space, and the high barrel vaults at either side of the central dome let in more light than the shallower groin vaults of the Stock Office. Just for fun we're going to float up into the dome. Lots of fascinating plaster detail to model again, including a Lion's head. Russell found a CAD mesh version that he used in the Consols Transfer Office so we could recycle that. There are some interesting joinery fittings to develop also. Let's back out onto the roofscape again. Some decorative details to be added to the lantern: a cornice all the way round and a parapet on two sides. 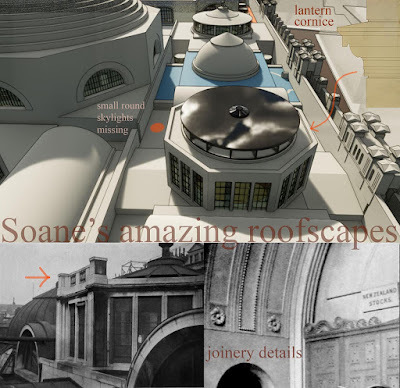 The roofscape itself is typical Soane. When I started to work on the Bank I had no idea how complex this inner world would prove to be. He loved to create effects of light, by stepping the roof levels and introducing light at high level from unexpected angles. Swinging around to the left we come to the last of the four halls, the Dividend Office as it was called in later years. At first sight it is a clone of the Colonial Office but Soane was not one to repeat himself exactly. It was much more fun to take a successful theme and play with potential variations. So we will enter by the dome. In place of the single row of Ionic Columns we now have pairs of Caryatids. Again we can borrow from Russell. 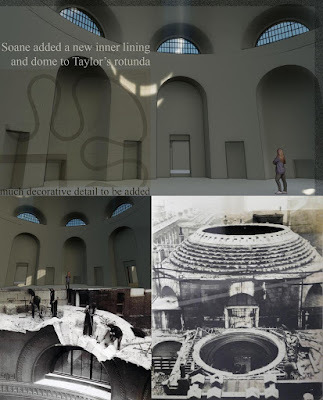 There are some really impressive watercolour sections that show how Soane inserted an independent masonry structure within Taylor's rectangular shell. The domes were built using hollow clay pots to keep the weight down so as not to disturb the original foundations. Lots of reference material for the decorative plaster work. 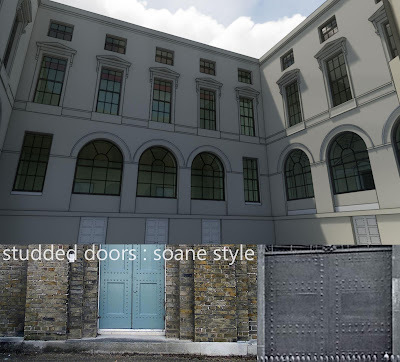 There are lots of interesting comparative studies we could do of the way Soane handled variations on a theme. The different plaster motifs used in the four replacement transfer halls would be one of these. It would be good to fit the transfer halls out with joinery and whale-oil lamps, add some people in period costume. Not sure how we would do that, but I would like to capture something of the atmosphere of the watercolours that Joseph Michael Gandy executed for Soane. 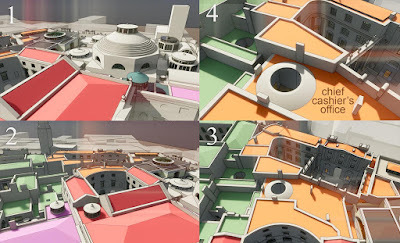 Now we are flying up again to get longer range shots of the complex, with its colour coded roofs: Red for Sampson, Pink for Taylor, Orange for Soane's NE Extension, Green for his NW extension. 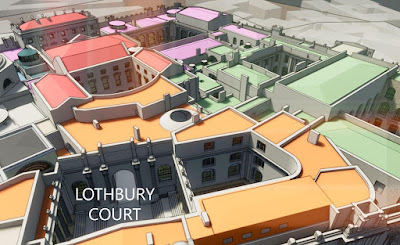 Image 1 is taken from above the Pay Hall, looking East, then we pivot to the North for image 2 with Lothbury Court in the background. Moving forwards and looking down we start to focus on the dome over the Chief Cashier's Office (part of the NE Extension) This is incorrectly modelled with a hole for a lantern. I was convinced at one stage that there must be a lantern, because this room is so badly lit without it, but more careful study of the drawings from the Soane Museum Online Archive has changed my mind. So we need to correct that. Dropping inside that space we find a very crudely roughed-out model. Lots to do here, and a shortage of source material also, so we will have to make some intelligent assumptions. 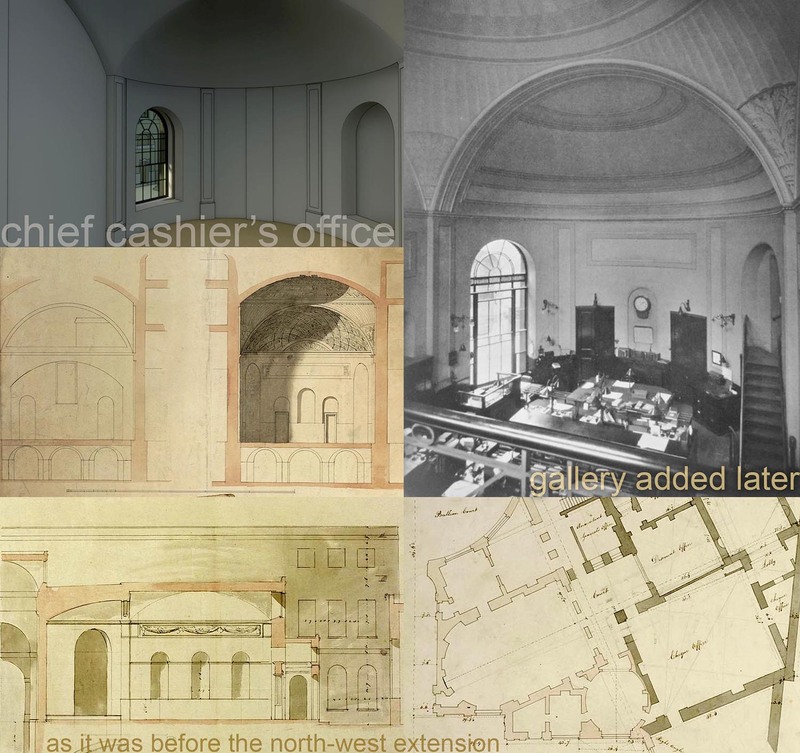 We can be sure that Soane made some modifications to the space when he constructed the NW extension. Did he add the gallery that appears enigmatically in the photograph as a small section of railing? I don't know, but he must have made some alterations at this side when he rebuilt the adjoining spaces. Well that's the end of part two. Probably two more episodes to go in this series. See you next week. 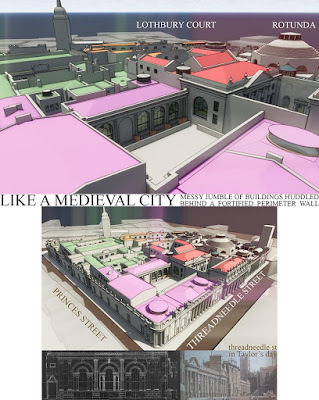 It is based on an Enscape3d export from the C4R model of the Bank of England. 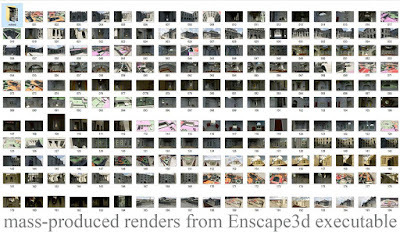 You can create executable files with Enscape that are easy to navigate around and take screenshots from. I generated almost 200 images in a couple of hours covering most spaces in this intricate building complex in quite some detail. From these images I am creating collages, spiced up with relevant reference material collected over the past two and a half years. 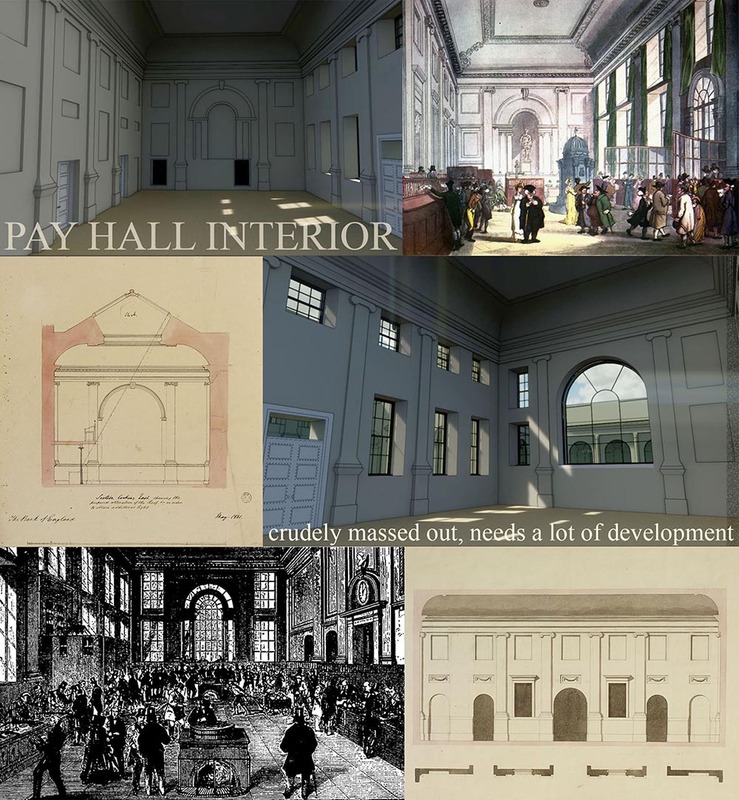 In doing this, I have tried to interweave the story of the Bank's evolution (from 1734 when Sampson began the work, to 1833 when Soane retired) with a commentary on the current state of the model, hinting at its shortcomings and potential tasks for participants to undertake. Hopefully this will inspire more enthusiasts to contribute and bring the entire project up to the rich level of detail that Russell and Alberto achieved in their work. At the top in Red, is Sampson's original double courtyard block, unpretentious, pragmatic, bog - standard Palladian. To the right, in pink, the remnants of Robert Taylor's bold and bombastic expansions: representing a period of aggressive confidence for the bank. To the left, and sweeping around, counter-clockwise across the foreground, John Soane's more thoughtful and enigmatic contributions, gradually reshaping the Bank of England into a complex, somewhat aloof, national institution. Swinging around we hover over Lothbury Court, the keystone of Soane's first great extension, shown here in Orange, the colour of the Dutchmen who invented so much of the financial wizardry that underpins the bank's remarkable success story. On display here is another kind of skill, no less impressive. 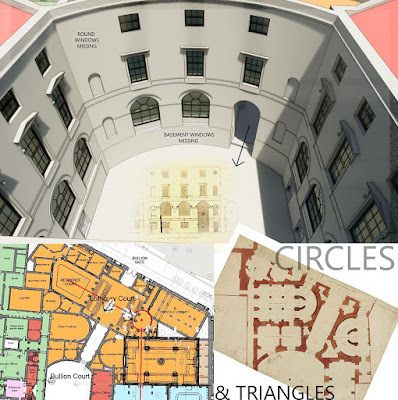 Soane took an unpromising jumble of irregular plots to the rear of the existing bank and rearranged them with a series of subtle shifts, inflections and sweeping curves, into an axially composed sequence of dignified formal spaces. The functional excuse for this virtuoso display is a new bullion route. This proceeds by way of a triumphal arch into Sampson's rear court, the inner sanctum. The geometry involved is tricky but deftly handled by an architect fully aware that this is his moment, his chance to go down in history. Glancing to the right we notice the residence court, hiding shyly behind a screen of four tall Corinthian columns atop a grand flight of stairs. This is Soane's bank at its tallest, a full four storeys high. A smaller, inset stair leads down to the basement storey: kitchens, laundries and store rooms. Two principal floors above provide comfortable apartments for two senior staff members (Chief Accountant & Secretary) Finally an attic floor gives sleeping accommodation for servants. This is standard planning for London Townhouses, similar in fact to Soane's own home in Lincolns Inn Fields. 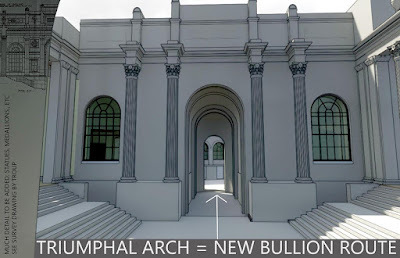 If we float backwards up a second grand stair, we can stand in the shadows behind another screen of giant columns and watch the bullion wagons trundle past, entering via the Porter's Lodge on our right and exiting through the triumphal arch. What did the classical language mean to Soane, the subtle mouldings, the urns and statues? Memories of his Grand Tour through France and Italy, symbols of his spectacular rise from humble beginnings as a bricklayers son. A sense of belonging to a rich and deeply rooted cultural heritage. Why have we traded the pride and vigour of Soane's generation for the shame and guilt we seem to crave today? But let's follow the money. Through a series of tall archways with sentry posts discretely placed on either side we proceed towards the light at the end of the tunnel. Does this symbolise the achievements to come over the next few decades? Factory production was already underway at Cromford Mill in Derbyshire. Bolton and Watt were busy perfecting Steam Engines, railways would follow, slavery would be banned, gas lighting was starting from replace the whale oil lamps that were themselves quite recent innovations. We emerge in the Bullion Court, safely back in Sampson's Palladian world when the flying shuttle was just an idea rattling around in Kay's brain. We are now one storey below street level, mostly because Bartholomew Lane, to our left rises rather steeply. To our right there is a stream, Wallbrook, but it has long since been channelled underground. I have shown the double doors into the Bullion Rooms as studded. This was a typical device of Soane's, expressive of strength and security, but also a practical way of incorporating steel sheets into timber panels. We are wandering around a BIM model. It's actually a digital database in the cloud, well isn't everything these days. In some ways it's the modern equivalent of a measured drawing. That's a device that has been used for generations to teach students to look more carefully and critically at our built heritage. Soane did a lot of it in Italy. But it's more like modelling than drawing, actually it's more like building than modelling. Looking down on the Bullion Court and turning back towards the passage where we entered, you can see that Soane demolished Sampson's straight back wall and substituted a gentle curve. This is sleight of hand to resolve the weird angles and preserve symmetry; cleverly done. Our model is far from complete and full of minor inaccuracies. No apologies. The journey is what counts. We are here to learn and it's a messy business. The building no longer exists, or at least it has been transformed beyond all recognition. We have a lot of reference material but it is often confusing and somehow contradictory. I'm sure historical research is always this way. Let's drop down to the ground floor and slide sideways through the wall. There should have been an external staircase to land on but we haven't built that yet. We find ourselves in a corridor. Sampson had an open arcade here, but Taylor and Soane have had their way with his modest cloister. By now it has become one leg of the long passage, an L-shaped route that Soane inserted into the fabric as part of his second grand expansion project. This was a new and private way for VIP visitors to access the governor and his deputy. Their quarters are to the left, through a doorway set in a curved recess. 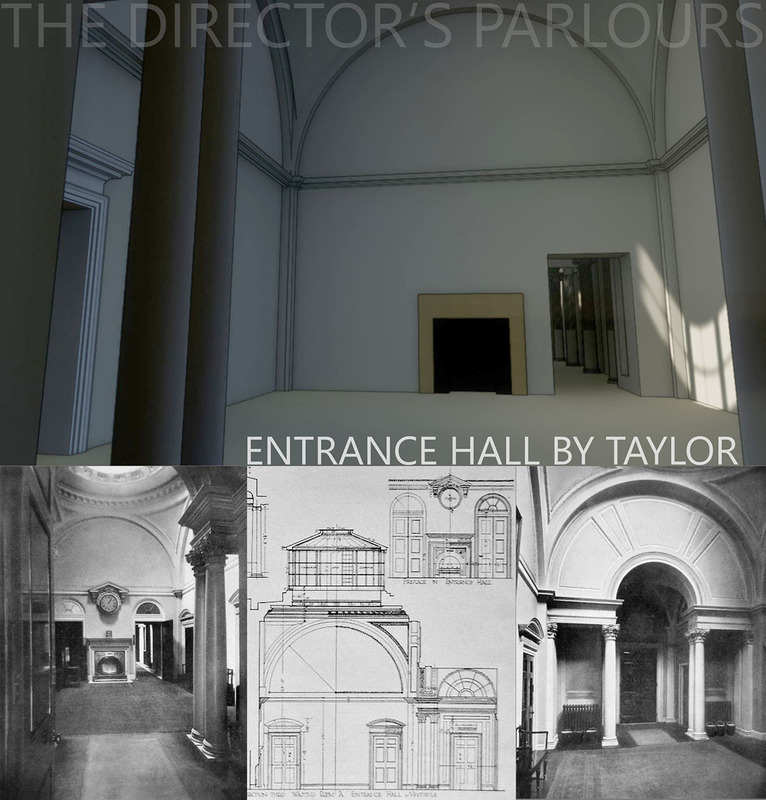 We have entered that door and arrived in a lobby designed by Taylor. It's square with a dome and a lantern. The model is rather crude at present, lacking all the fussy detail that Taylor proudly added to his Interiors. Ahead of us is a fireplace, and to the right of that a passage designed by Soane. This appears a little dark, but in reality Soane's highly inventive top lighting would have provided a warm glow. All the same a more brightly lit lobby beckons ahead. The North-west extension is very different from it's predecessor. None of the curves and angular shifts. Everything is strictly rectangular in plan. But the way these boxes are varied in size and shape makes for just as elaborate a jig-saw puzzle. He is dealing with a deep plan and tightly packed spaces. The game is all about varying the heights so that sections of wall are exposed at high level. I think these he inserts windows of all shapes and sizes. 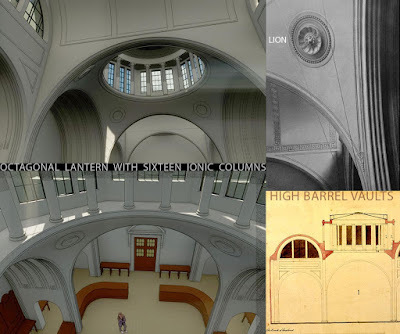 The centre lobby has two lunettes, fitting snugly below barrel vaulted ceilings. The offices of the governor and his deputy are accessed from this space. Beyond, through a doorway in one corner is another space, the Rustic Lobby. This is like a tower with small arched windows arranged in triplets up aloft and a central lantern. Doors lead off in all directions, to waiting rooms, the director's library and down another passage. But we'll come back to that. Let's go flying again, and look back at that tower over the rustic lobby. Below is the large pink roof over the court room. Pink means Taylor remember, ares where Soane did not get the chance to rework the design to any great extent. To the left a double storey block that housed the original barracks. The Gordon Riots had left the Bank and the government nervous least the French Revolution should prove infectious. A detachment of soldiers arrived each evening to patrol the battlements. 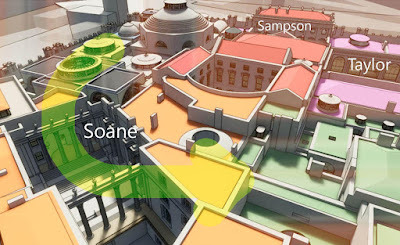 Green denotes the rectilinear patchwork quilt of Soane's North West extension. Floating over this we come to the Waiting Room Court. Looking down you can see an open-sided loggia in Soane's highly distinctive mature style : Classicism stripped down to it's essentials, rather flat with linear incised grooves. 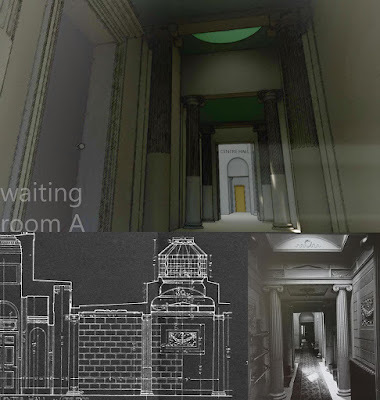 Once again the model is far from complete, but still you get a taste of the spatial drama that Soane could conjour up. Let's drop down into that loggia and look East as if we are important clients coming for a meeting. In the distance you can see the passage that began life as Sampson's cloister. That's where we would turn right, and eventually right again, skirting around three sides of the courtyard. At the extremely right of the picture is a window looking out from the Governor's Room. Perhaps he is watching us being shepherded along by a footman with a pink jacket. But we are going to slide sideways again and take a look at the courtyard itself. This has been roughed out quite successfully in the current model but much work remains to be done. The loggia side is meant to be open of course, but the two flanking sides should have windows in them, and the larger arched openings in the basement storey should be glazed. There are other shortcomings: Corinthian columns should not be fluted, expressed joints in the stonework absent, along with various ornamental details. But let's return to the loggia and back up to its point of origin, known as the Doric Vestibule. This is a new VIP entrance that Soane designed, leading off Princes Street. It's a domed space lit by semi-circular windows at high level. Once again all the basic setting out is in place, but detail is lacking. Backing up even further we find ourselves in Princes Street itself, looking at the detailing of the external screen wall. This was much criticised at the time for its idiosyncratic treatment of classical themes. 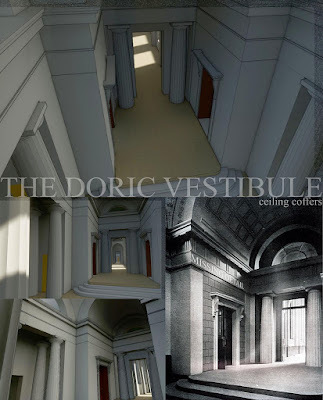 Nowadays we think of it as a classic example of Soane's distinctive style and lament the gross simplifications that Herbert Baker imposed upon it when he rebuilt the bank in the 1930s. Note the extreme flattening of the pediment over five arched openings that marks the doorway we have just backed out of. This part of the screen wall was built as part of the North-West Extension, but moving south towards Threadneedle Street, there was an existing screen built by Taylor. Soane only managed to persuade the directors to replace this much later. So for almost two decades, the perimeter of the bank was a strange mixture of styles: now Soane, now Taylor, now Sampson. 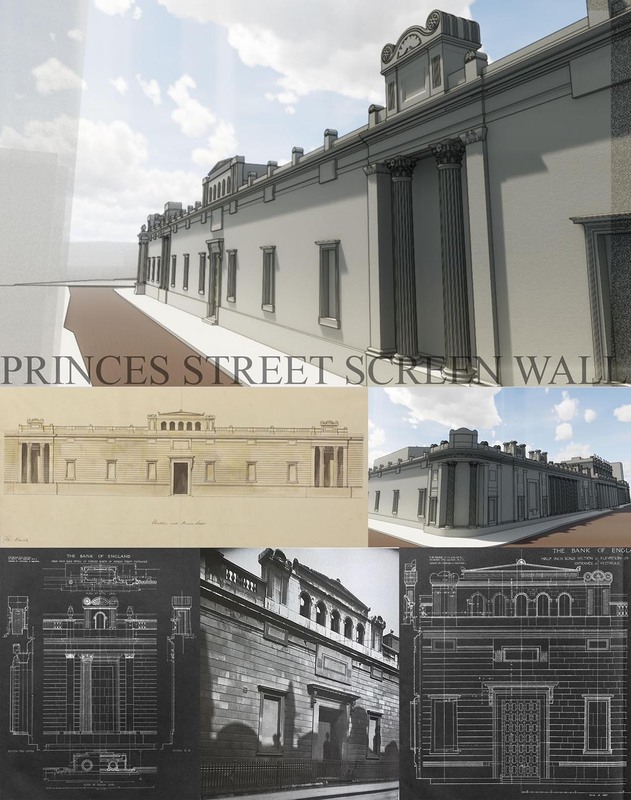 The evolution of the screen wall is a story on it's own: a drama in three acts with Soane summoning up new reserves of inventiveness each time, to re-establish a unified scheme as additional territory was incorporated. In every case he blended existing themes with new motifs to keep the rhythmes fresh but unified. Here the model is quite well developed, but for some detail at the corners and the recessed horizontal joints which are only indicated as a surface pattern in the material definition. And, as always we are still looking for students and other enthusiasts willing to lend a hand at improving the model - no matter what your skill-set.